In 1999, Yarmouth, Maine native Hanley Denning founded Sage Passage (Camino Seguro) in Guatemala City for the children whose parents scavenge through trash at the city's sprawling dump looking for items to resell. Children would work alongside their parents in the dump and Denning wanted to give those children a chance to get an education to help break the cycle of poverty. She started helping 40 children in 1999 and now the program works with over 500 children. Hanley Denning died in a tragic car accident in Guatemala on Janurary 18, 2007. These photos of families and children served by Safe Passage were taken the following week. To learn more about Safe Passage, go to safepassage.org. All photos are copyright, 2007 Portland Press Herald. 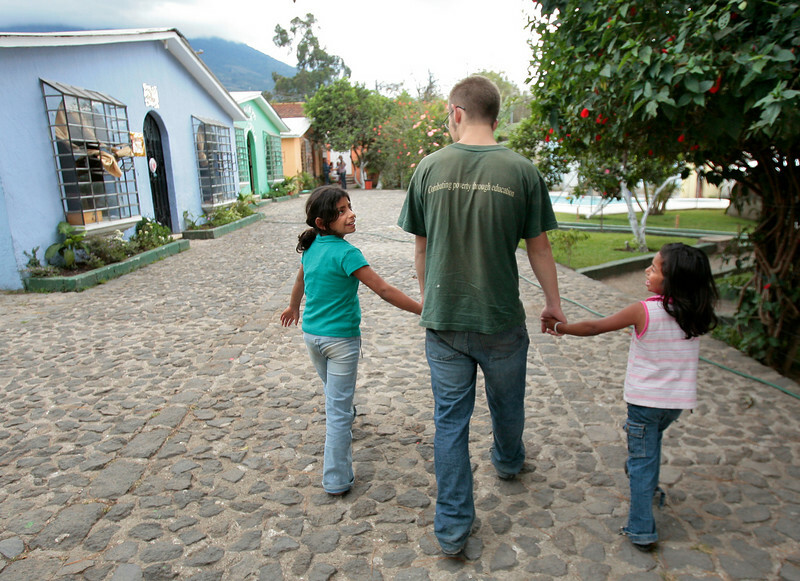 Sam Wilcox of Cumberland walks with Lupe Garcia Barrios, 11, left, and Catherine Lopez Reyes on the grounds of Casa Hogar in Antigua, Guatemala on Thursday, January 25, 2006. Wilcox has been volunteering with Safe Passage for five months and at Casa Hogar, a residential program, he works with children who have been severely neglected or abused.